All natural DIY- Produce Spray for cleaner fruits and vegetables. 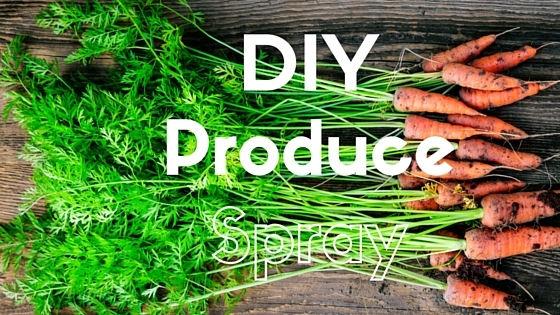 All natural DIY: produce spray for cleaner fruits and veggies. Do you wash your fruit & veggies before you eat them? Homemade fruit and vegetable washes are effective at removing residue from produce and also help preserve the fridge-life too. The simplest and least expensive natural produce cleaner is plain white vinegar. Place the fruits and veggies in a freshly cleaned kitchen sink, fill with water, and add 1 cup of white vinegar. I let soak for up to an hour, scrub gently and rinse clean or you could make this produce spray to use on your produce items before you are ready to wash. Let it sit for 5 minutes or so and then rinse as usual! For the spray just mix all of the ingredients in a bowl (note the baking soda will fizz when it mixes with vinegar) and place into a spray bottle.